I hope you all had a wonderful weekend! Mine was great and in particular Sunday was the best. We slept in late and got things done around the house, which is always great to have all the chores done before the week begins, you know? The weather here is slowly beginning to change. The nights are becoming cooler and I have have even seen some trees with their leaves turning. It is wonderful that we can still sit on the porch and enjoy dinner but you may need a light sweater to enjoy dessert at all. Not that I am wishing away summer but I really love fall more than any other season always have. I have never been much of a shorts and tshirt kind of girl. Personally hate shorts mostly because being an athlete growing up I never liked how my legs looked in them but leather boots, skinny jeans and layered tops with scarves and a light hat has always been my specialty. So all that to say I am excited for fall to layer up with all my new purchases for Fall. 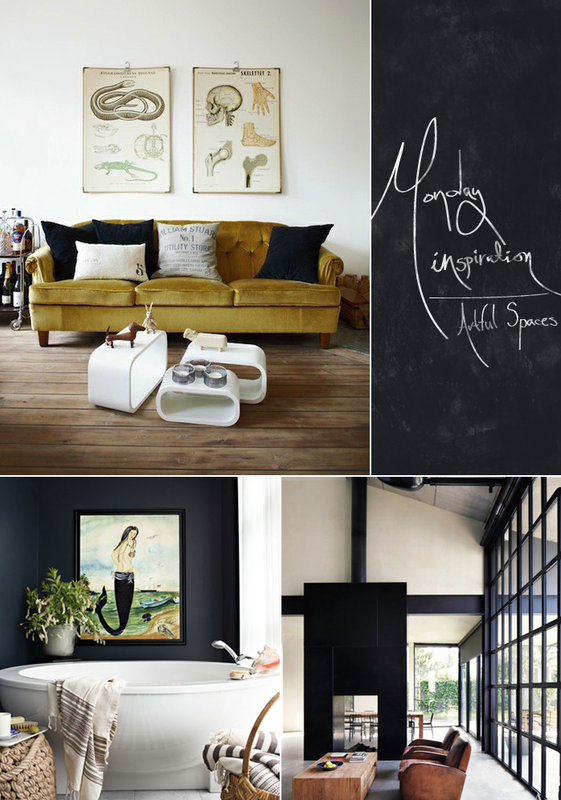 Today I was totally inspired by these amazing interiors. Mike and I have been dreaming up how to arrange our space and actually get it put together but in my dreams this is what I think about and I am sure you will most likely agree these spaces are beautiful. I have dug the whole dark accents in interiors for some time but these make it look even better than I could imagine. Not to mention isn’t that mustard couch the perfect old meets new combo? Kind of obsessed! Anyways these spaces really hit the spot when I woke up this morning.